I think I'm in love. 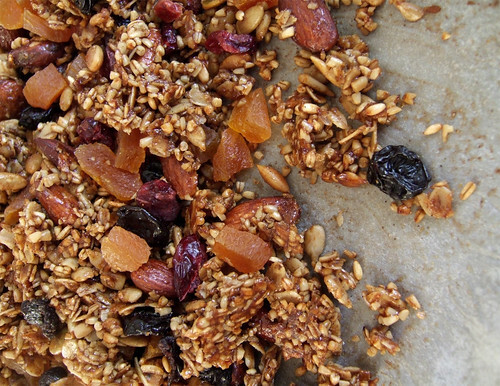 In love with this granola, that is. I've been such a huge fan of granola in the past year. My favourite way to start a morning is with a bowl of yogurt, some fresh fruit and homemade granola, drizzled with a bit of honey or maple syrup. For the past year, I've had this go-to recipe that I loved to make. It was incredibly easy and delicious, with lots of flavour and also very flexible in what you could throw in and swap out. It was a staple in my pantry. But when I came across this recipe on my friend Tonya's blog, I was instantly intrigued. Steel-cut oats in granola? I'm a huge fan of steel-cut oats when making oatmeal because of its texture, but I wondered how it would work out in granola. I was very excited to try this out. The result is absolutely amazing. With the maple syrup and honey, what you get is a granola that's almost brittle-like, with big chunks of granola and nuts that makes it easy to munch on on its own. With the added fruit, this is incredibly lovely sprinkled over some yogurt. 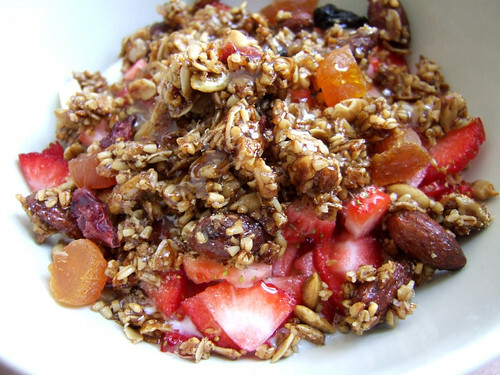 A must-try for any granola lover! Preheat the oven to 300˚F. Line a baking sheet with parchment paper. Combine both oat varieties, almonds, seeds, maple syrup, honey, olive oil, vanilla, spices and salt. Evenly spread mixture on the baking sheet and bake for 50 minutes, stirring every 10 minutes. 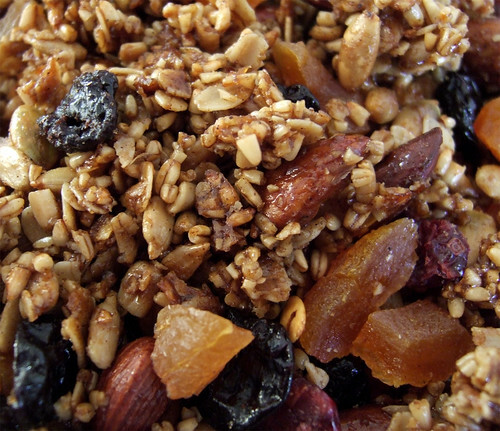 Once golden and toasted, remove from the oven and sprinkle the dried fruit and coconut on top of the warm granola. Let cool before serving or storing. Granola will keep in an airtight container for up to a month. Amelia PS February 22, 2011 at 9:11 a.m.
Suzanne Gardner February 22, 2011 at 3:14 p.m. Anonymous February 22, 2011 at 5:02 p.m. It's been so long since I've made granola and have recently thought that I should start again. I'll try this one- with some modifications, of course. Bonita February 22, 2011 at 10:21 p.m. This is such a great recipe. I definitely love how you get big clusters of granola...so nommy to snack on with the fruits and nuts in there as well. Melody Fury - GourmetFury.com February 23, 2011 at 8:53 a.m.
Mardi @eatlivetravelwrite February 25, 2011 at 12:02 p.m. I just made a great recipe out of Bon Appetit but I think I might have to try this one! Lori October 18, 2011 at 10:12 p.m. In the oven! I really like baking the whole oats with the nuts and spices, and adding the raw coconut and fruits at the end! Nice suggestion. I added a bunch of seseme seeds to mine! Bonita October 19, 2011 at 9:09 p.m. Thanks Lori! Good suggestion on the sesame seeds! Anonymous October 22, 2011 at 10:35 a.m. I'm making today and will probably add flax seed and would add wheat germ if I had any. Also might try with coconut oil instead of olive. Anonymous May 27, 2013 at 8:43 p.m. Sorry, is that cooked steel cut oats? Or raw? Bonita May 28, 2013 at 5:39 p.m.